More than 68,000 pounds of Perdue gluten-free chicken nuggets were recalled January 17 due to possible wood contamination, according to the USDA. The 22-ounce packages of frozen Perdue Simply Smart Organics Gluten Free Chicken Breast Nuggets were produced in October and were shipped to stores nationwide. According to the USDA, the problem was discovered when three consumer complaints reported that wood was found in the nuggets. There have been no confirmed reports of adverse reactions due to consumption of these products. “After a thorough investigation, we strongly believe this to be an isolated incident, as only a minimal amount of these packages has the potential to contain pieces of wood. 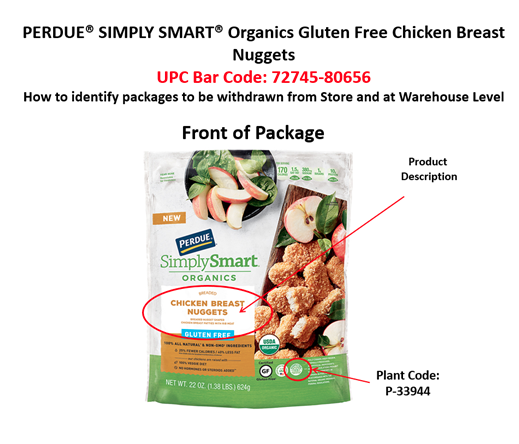 Out of an abundance of caution, we have decided to recall all packages of PERDUE® SIMPLY SMART® Organics Gluten Free Chicken Breast Nuggets produced during the same product run,” said Jeff Shaw, Perdue’s Vice President for Quality Assurance, in a press release. Check your freezer for chicken nuggets purchased in the last few months for potentially contaminated bags and throw them away or return them if you do find them. The potentially contaminated bags have a “best if used by” date of 10/25/2019 and a UPC Bar Code reading “72745-80656” on the back label. The front of the bag has a plant code of P-33944 in the bottom right corner.